[rudolph] has provided the code they used for this project — just be sure to change the output pin or any other modifications as relevant to your build. They’ve even created an app to make controlling the rudLights easier. If Bluetooth isn’t your thing then [rudolph] is working on building an Arduino Pro Mini version, but no word on when that will be done. We love a good prop or inspired replica here at Hackaday, so this framed Alphabet Wall is in good company. 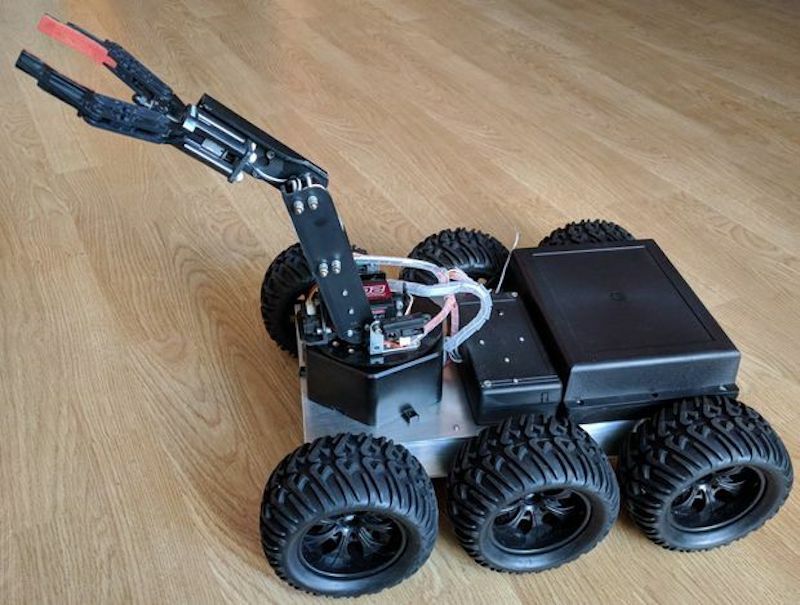 In order to create the ultimate off-road RC rig, “asrebro” designed his own six-wheeled vehicle, operated with the help of Arduino. To give it decent range and reliability, the hacker turned to a stock transmitter and receiver, but routed the PWM signals onboard to a Mega. 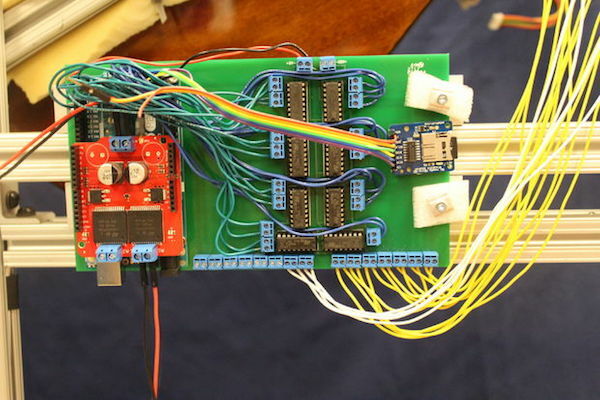 The Arduino uses a pair of H-bridge boards to drive all six motors/wheels for tank-like movement. 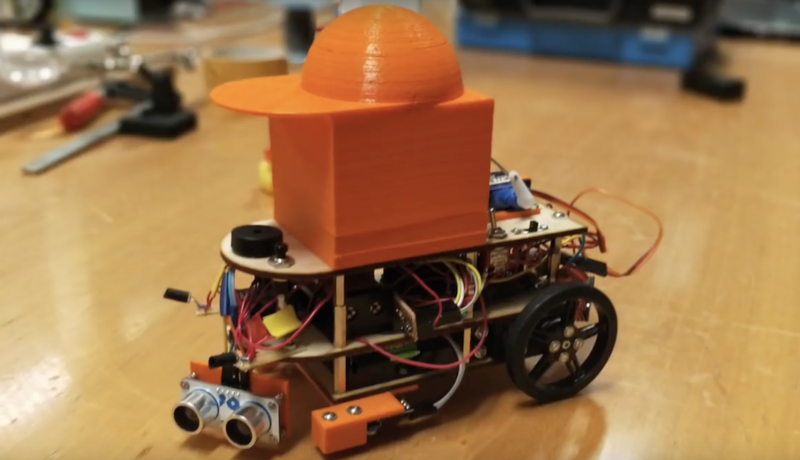 Since an Arduino is used, this opens up a wide range of manual and automatic control options, and could even be used to power robotic accessories like a gripper or gimbal with a camera. I decided to build a bigger robot that will easily overcome various obstacles on its way and will be able to move with a load of at least a dozen kilos. I also assumed that the robot should be able to cope in difficult terrain such as sand, snow and rubble. 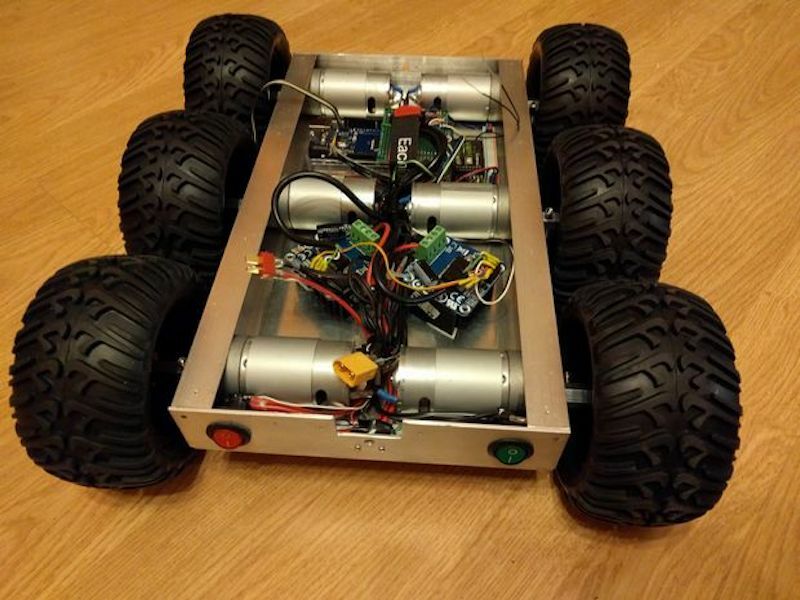 To make it possible, I built a 6-wheel [aluminum and duralumin] chassis equipped with 6 motors of sufficient high power and suitable motor driver and power supply. I also wanted my robot to be controlled from a long distance (at least 200 meters) so I used a good quality 2.4GHz transmitter and receiver. You can see it in action below, traversing through a forest near Warsaw, Poland. 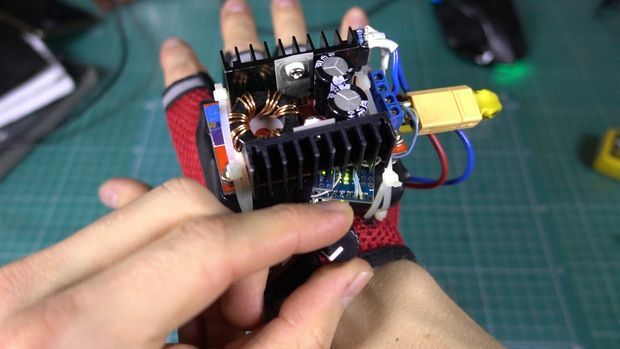 The RoboGlove project is a robotic glove by students at the Université Libre de Bruxelles that is designed to assist the wearer when continuously gripping objects. This is accomplished by a series of three servos that transmit force through cables for the index finger, middle finger, and thumb. 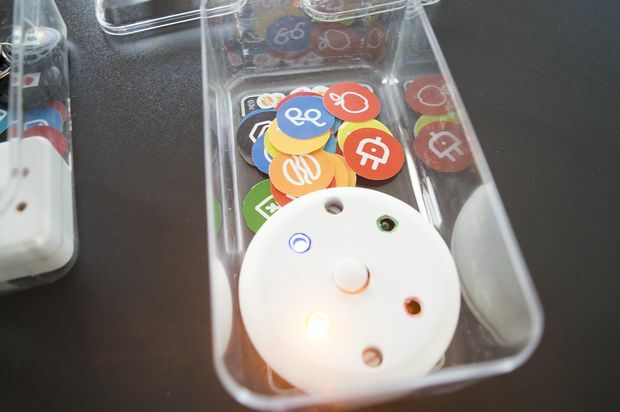 Control is via an Arduino Uno, which takes input from pressure sensors in the three finger fixtures, helping the wearer keep gripping when force is initially exerted to close a fist. 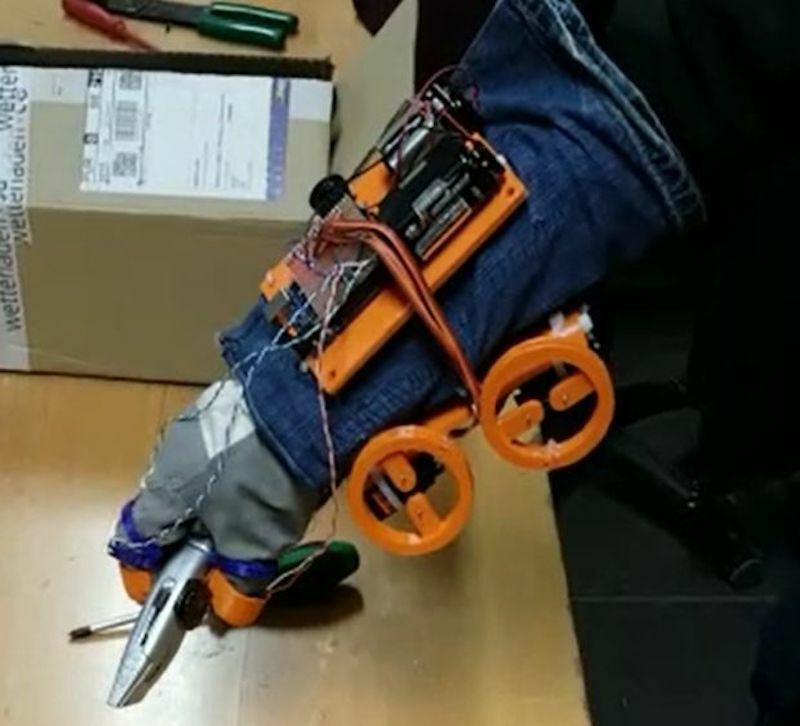 The glove has a wire connection that links the fingers to some servo motors: a wire is attached to the extremity of the finger and to the servo, so when the servo turns, the wire is pulled and the finger is flexed. In this way, by controlling the grip done by the user through some pressure sensors in the extremity of the fingers, we are able to actuate the motors in a controlled way and help the gripping by bending the finger proportionally to the rotation of the motors and so to the rolling up of the wires. In this way we should be able either to allow weak people to grip objects or help even people in physiological conditions to grip objects and to keep it without any effort. While still a prototype, it’s an interesting device that could be developed further into a very helpful augmentation. You can see it in action below! While you might not be able to actually manipulate time, this glove by YouTuber “MadGyver” certainly makes it appear that way. 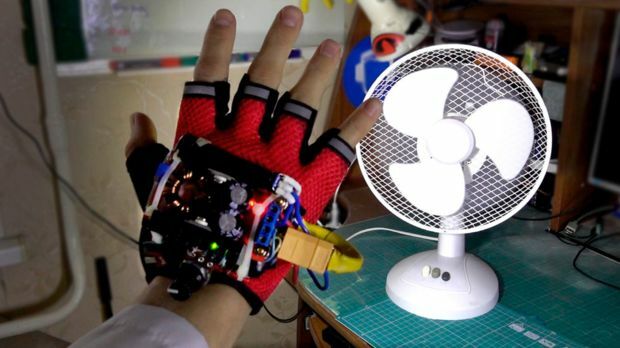 His glove, shown in the video below, uses a gigantic LED controlled by an Arduino Nano to allow objects such as a fan, water falling from a shower, and a spinning top to stop, slow down, and even reverse. The trick is that when the LED’s frequency is aligned with that of the observed moving subject, it lights it up in the same position over and over, making it appear to pause. Frequency is adjusted by rolling one’s hand via an accelerometer, or a potentiometer mounted in the base of the glove can also be used. If you want to build your own, instructions can be found here and the Arduino code and schematics are available on GitHub. [Raz85] notes that this particular build is more accurate for bearing as compared to attitude, as well as needing manual north-south alignment when in a fixed position. The tradeoff for this mild irritation allows the sextant to be positioned on a boat to get its heading. If you’re taking to the high seas, you may want another piece of technology that was critical to accurate navigation across the oceanic expanses of our planet: an incredibly complicated timepiece called a marine chronometer. 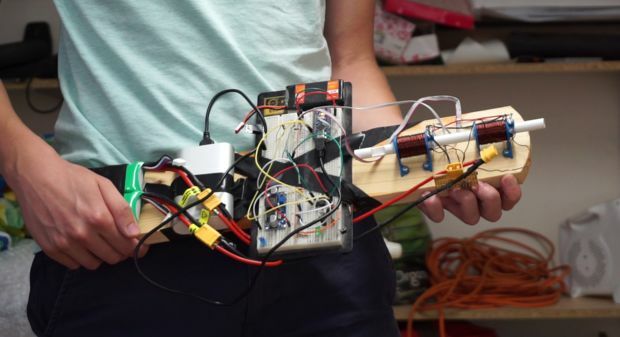 Although many would consider engineering to be an art in itself, if you’d like to create your own robotic band, this Instructables write-up for the GuitarBot is a great place to start. 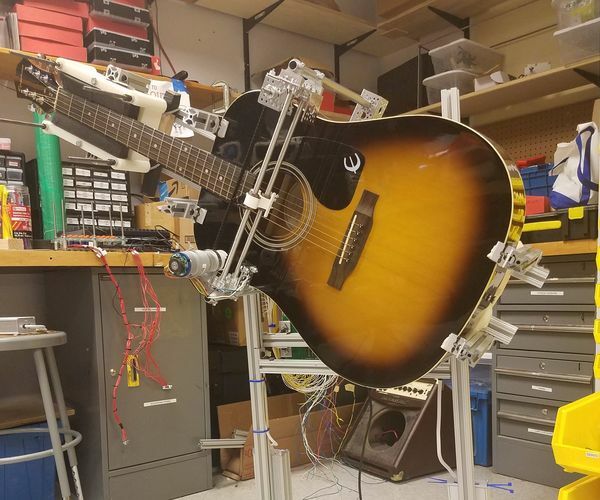 The guitar-playing robot is comprised of three major components: the brains, a strummer, and a chord mechanism. An Arduino Mega, a specially-ordered PCB and several shields are used for control, and a series of solenoids press down frets as needed. Finally, strumming is handled by a pick that is pulled by a DC motor and belt assembly, all of which is held up by an aluminum frame. If you suppose that electromagnetically-propelled projectiles are strictly the purview of well-funded government research labs, think again! 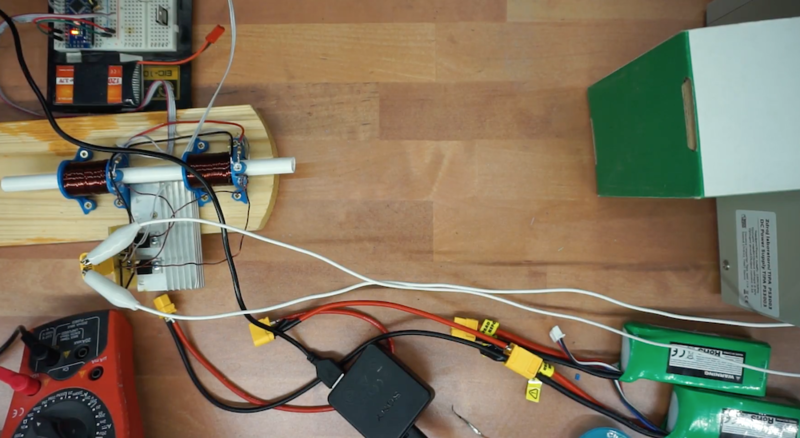 Using two sets of coils wrapped around custom 3D-printed base structures and an Arduino Nano for control, YouTuber “Gyro” created his own coilgun capable of propelling steel fast enough to dent a piece of wood. When fired, a photodiode at the end of each electromagnet coil sends a signal to the Arduino. This, in turn, shuts off the coil, allowing it freely escape the barrel. As noted in his Instructables write-up, the gun is constructed without large capacitors, which can be expensive and dangerous. 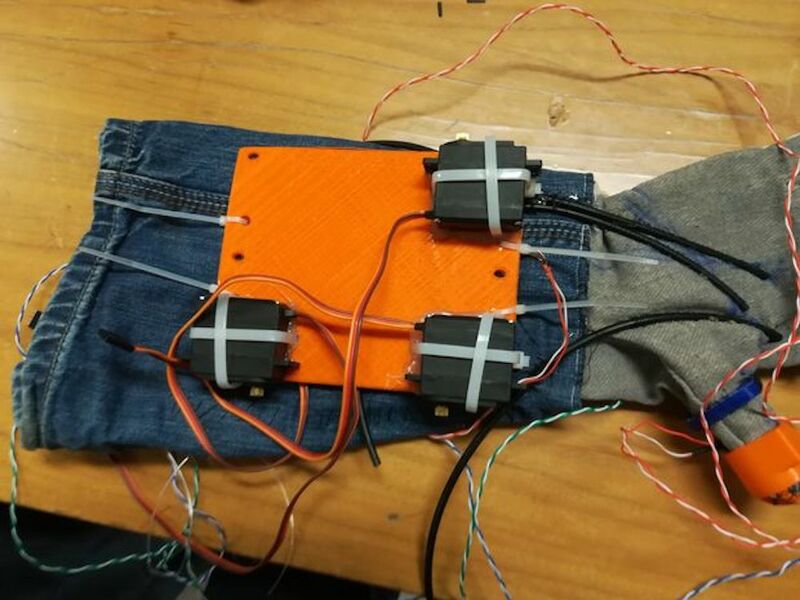 Instead, two LiPo battery packs are combined to produce around 22 volts, though this and the number of coils used, could be increased to produce a more powerful device! 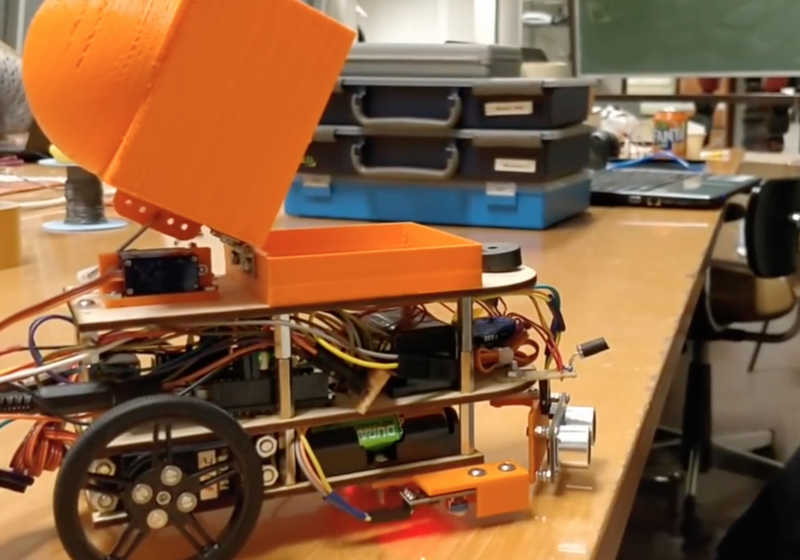 In addition to controlling the lasers, his device can sense hand motion on top of it using an array of 12 ultrasonic sensors, and can even coordinate music through a built-in MIDI output. As seen in the demonstration video, Bumstead’s project–which was constructed with the help of a CNC router–looks like a cross between a coffee table and a test fixture for a space vehicle. 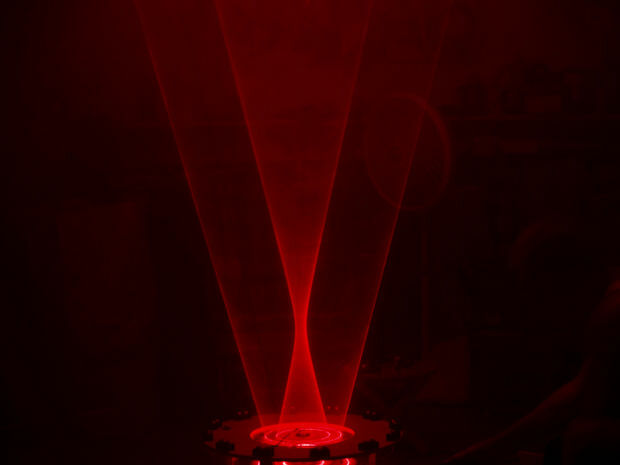 When activated, a brushless motor spins the two lasers at a high speed, while the Mega controls the laser angles via two servos, creating a unique vortex-like light show! I included distance sensors in the device so that the laser sheets could be manipulated by moving your hand towards them. 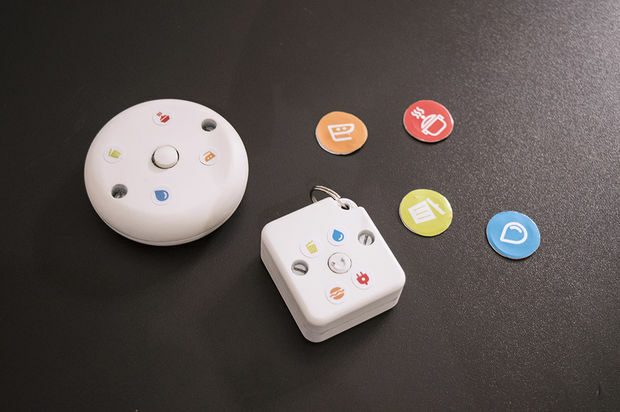 As the person interacts with the sensors, the device also plays music through a MIDI output. It incorporates ideas from laser harps, laser vortexes, and POV displays. 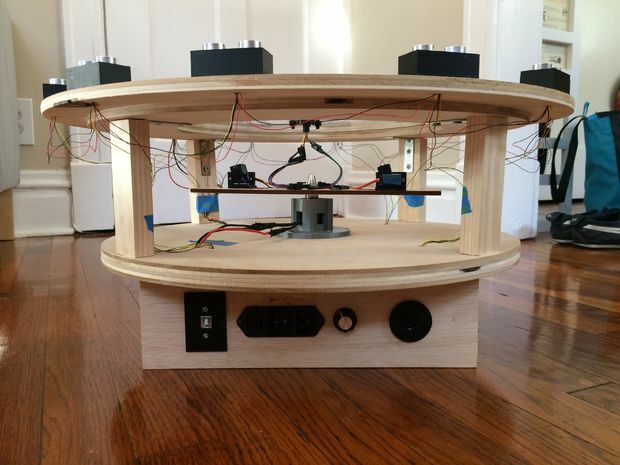 The instrument is controlled with an Arduino Mega that takes in the inputs of ultrasonic sensors and outputs the type of laser sheet formed and music generated. Due to the many degrees of freedom of the spinning lasers, there are tons of different laser sheet patterns that can be created. You can find more details on the laser sheet generator on Instructables.